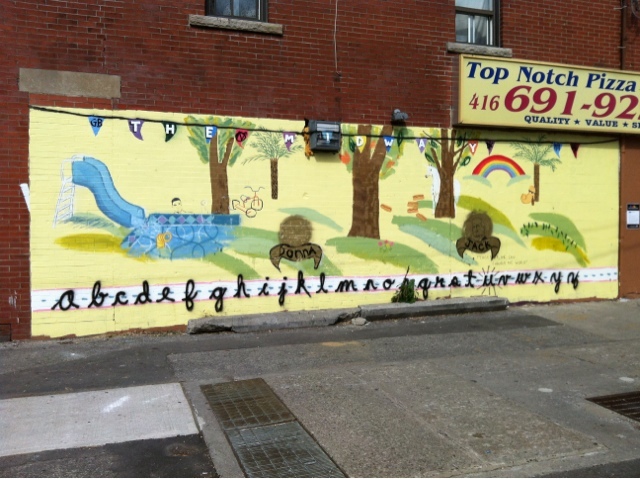 The twitter mural at the corner of Monarch Park & Danforth has been completed (or is almost complete...) and it looks pretty cool! Pioneer perused the twitter suggestions via @rideoutmural to see what kind of ideas our neighbours had for this mural and some of them were pretty interesting. The finished product is great, simply because it reflects our past, present and future. An alphabet at the bottom points to the baby boom in the neighbourhood, giving kids an eye-level opportunity to learn their letters. The Jack Layton image is bittersweet - it represents both the history of this ward as an NDP stronghold as well as the remembrance of a man that was integral to urban life in Toronto (and the fact that it's on a corner is not lost on us - how often have we run into Layton busking at a street corner??). Pioneer's favourite part is the Midway banner at the top, a tongue in cheek blast from the past when this area of the city was called Upper Midway - the midway "grey area" between Toronto and Scarborough. The only disappointment is that this tweet by @adconnell was not incpororated: "how about a scene of happy robots at monarch park? My 3 year old suggests it every morning we come by!" Now that would have been something!